Enrofloxacin for chicken bacterial disease is a broad-spectrum bactericide with special effects on mycoplasma. It has bactericidal effects against Escherichia coli, Klebsiella, Salmonella, Proteus, Pseudomonas aeruginosa, Haemophilus, Pasteurella multocida, Pasteurella hemolyticus, Staphylococcus aureus, Streptococcus, and the like. 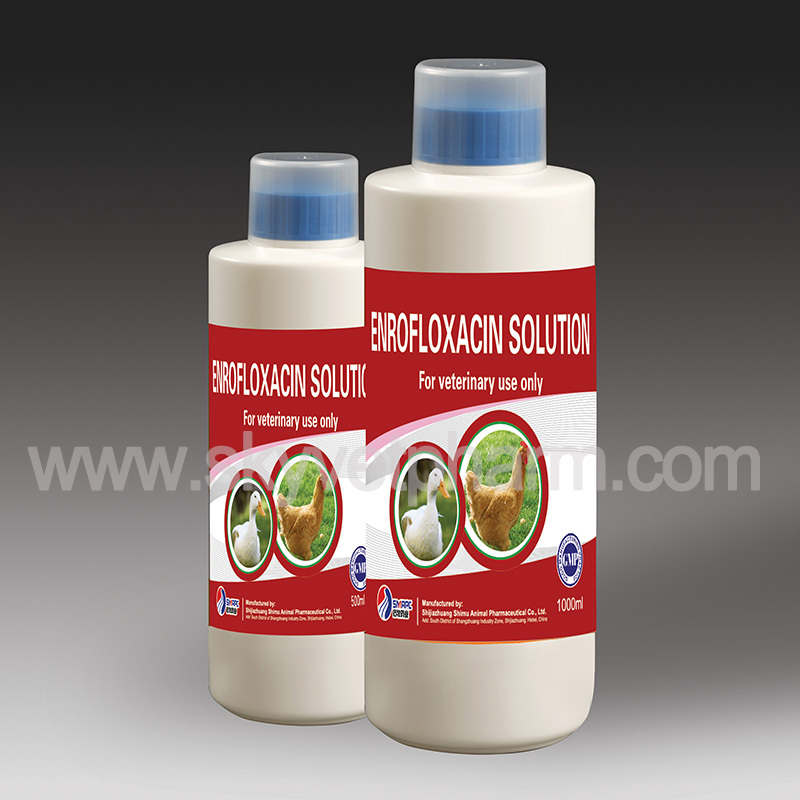 Enrofloxacin Solution can be used as an animal drug. It has a long half-life in animals and a good tissue distribution. It is a broad-spectrum antibacterial agent and has antibacterial activity against Gram-positive bacteria, negative bacteria and mycoplasma. It is used for the control of vibriosis and E. coli disease in farmed fish. This product is a synthetic third-generation quinolone antibacterial drug, also known as ethyl ciprofloxacin. It was approved by the FDA on October 4, 1996. It is a quinolone antibacterial drug for livestock and poultry. It can bind to the bacterial DNA gyrase subunit A, thereby inhibiting the cleavage and ligation function of the enzyme, preventing the replication of bacterial DNA, and exhibiting an antibacterial effect. It has broad-spectrum antibacterial activity and strong permeability. It has a strong killing effect on Gram-negative bacteria, and also has good antibacterial effect on Gram-positive bacteria. It has good oral absorption and high blood concentration. It is stable and can be widely distributed in tissues. Its metabolite is ciprofloxacin, which still has strong antibacterial effect. Almost all of the pathogenic bacteria in aquatic animals have strong antibacterial activity. It is effective against serious infections caused by drug-resistant pathogens and has no cross-resistance with other antibiotics.